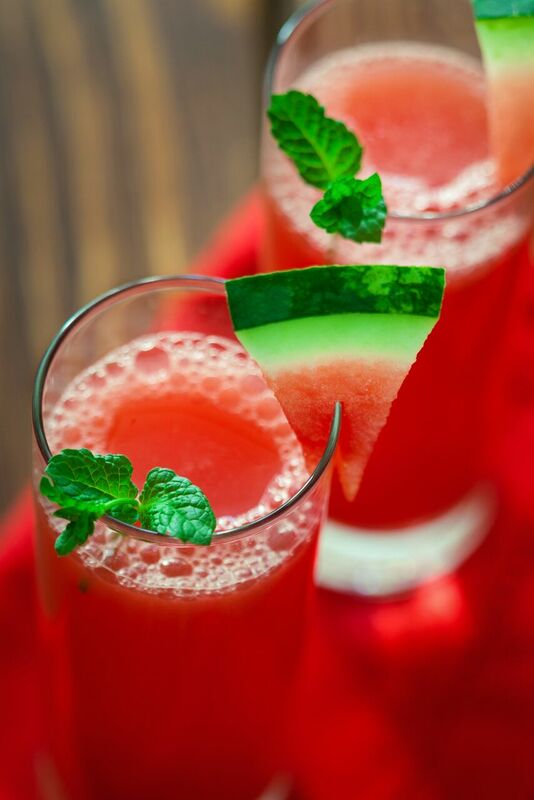 Hydrating, tasty and refreshingly satisfying, you might just make this fresh Watermelon Tomato Mocktail your summer favorite! Garnish of basil? mint? Either taste great! For more yum, giveaways and our food philosophy, be sure to sign up for our Seasonal Newsletter and follow us on Facebook, Twitter, Instagram and Pinterest. PS We truly get a kick out of your favorite food pic moments with friends and family! Remember to share that love and post pics with hashtag #DontWorryEatHappy. Chop and puree tomatoes with fresh watermelon cubes in a food processor until well-blended and frothy. Add salt and pulse. Strain juice through a shaker (this might require a few batches) or cheesecloth over a large bowl. The liquid should be pinkish clear. Yields 1 gallon. Pour juice into beverage dispenser with chopped ice and fresh basil or mint leaves. Garnish glasses with a watermelon wedge and fresh herb sprig. Serve immediately.